Dream Girl Hair offers the sophisticated woman of today, real human hair extensions adding glamour and class to any style. This luxury hair range provides a fuller, more alluring look in an exciting collection of colours that blend well with your natural hair or make you standout with our Fantasy Fancy colours. 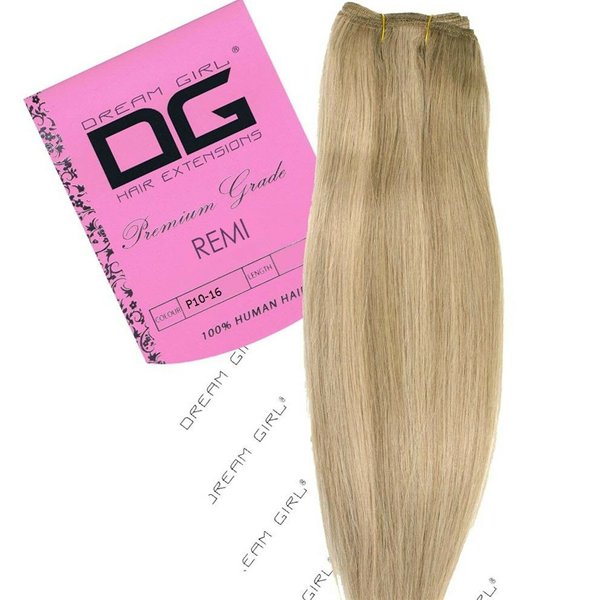 Our DG wefts are double-wefted, single drawn to give a more natural-looking hair extension. This luxury hair provides a fuller, more alluring look in an exciting collection of colours that blend well with your natural hair. Dream Girl wefts are 100% premium quality human hair extensions. Our silky straight hair is the most popular range as it is our premium quality hair on a weft. Our silky straight hair can be easily sewn in or attached by applying non-evasive glue. Perfect for all hair types, adding volume and length. Available in a huge range of natural and pastle colours.